Updated! 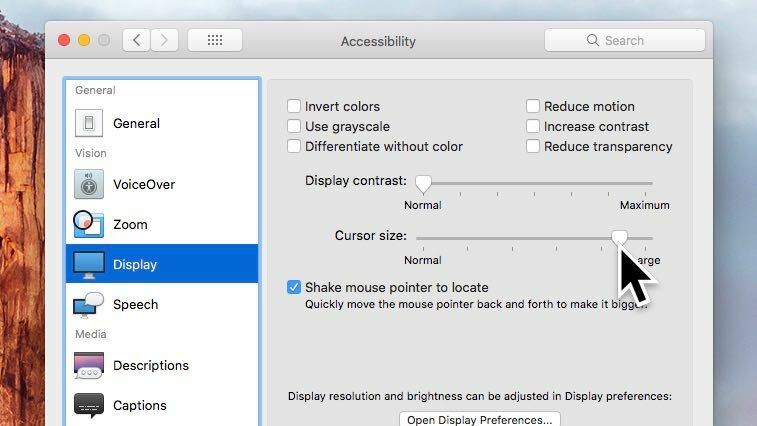 Having a hard time spotting that itty-bitty mouse cursor on your PC or Mac display? You’re not the only one. Indeed, as computer displays get bigger and sharper, on-screen mouse pointers keep getting tinier and tinier. Will they eventually shrink down to nothing? Good question. 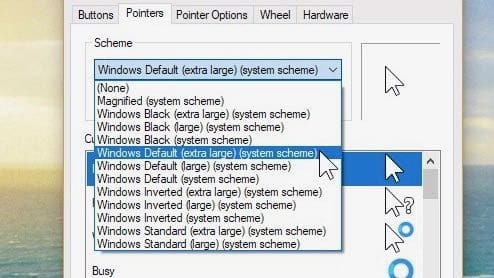 Well, there’s an easy way to save both your eyesight and your sanity: by dipping into your system settings and boosting the size of the mouse pointer. Here’s how to do it. First, let’s head for the Settings screen by clicking the Start button, then click the Settings icon (the one that looks like a gear). Once you’re on the Setting screen, click Devices, click Mouse in the left column, then click the blue “Additional mouse options” link (under the Related Settings heading). Doing so will open the Mouse Properties window. Next, click the Pointers tab, then click the drop-down Scheme menu to reveal your cursor options. Among them: Windows Standard (a white cursor with a thin black outline), Windows Black (a black cursor), and Windows Inverted (a black cursor that inverts its color as it passes over windows, icons, and other items on the screen). Each cursor scheme comes in three sizes: regular, large, and extra large. Pick the cursor you like (the bigger the better), then click the Apply button. To make the cursor even more obvious, try clicking the “Enable pointer shadow” checkbox. Open the Apple menu (just click the Apple icon in the top-left corner of the page), then select System Preferences. Click the Accessibility icon, select Display in the left column, then try moving the Cursor Size slider; when you do, the mouse cursor will start to grow, and grow, and grow. Satisfied? Just close the window.